The Mosaic puzzle is a simple but compelling logic puzzle that offers two pieces of satisfaction for the price of one! First and foremost, there is the immediate challenge of solving the puzzle, and secondly, once that is done you will create a simple black and white image, as shown in the completed mosaic puzzle grid on the right. The mosaic puzzle is simple: each square contains a number, or is blank. If the cell contains a number, this indicates how many of the cells around the cell are to be shaded in (including diagonally adjacent cells). This may or may not include the cell itself. This means that if you see a 9, then you can instantly colour in the cell itself and all the cells that touch it. Similarly if you see a 0, then you know that cell and all the cells that touch it are to be left blank: it is useful to mark these in some way, perhaps with a dot or small cross, as knowing which cells must be blank is crucial to solving the puzzle. 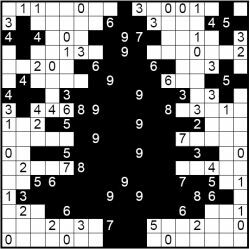 Through using logic alone, then you will be able to gradually work out whether each cell in the whole puzzle is to be shaded or not, and thus reveal the final image. Sometimes there will only be one combination possible around a given number, at other times you may need to work out which of the options for the cell are compatible with its neighbours. But you never need to guess or resort to trial and error at all: fair logic only is required, and of course there is one solution to each puzzle. If you are interested in buying mosaic puzzles for publication, then please do contact us with your requirements.